Warning: massive spoilers for Halloween lie ahead! It's pretty common for horror movies to leave room for a sequel, but the whole ordeal can be very tricky. Some horror films work better as standalone films, but some are just screaming for a follow-up. Usually, filmmakers will tie up almost all of the loose ends but leave that one lingering question mark, just in case. This is pretty much the case for the new Halloween reboot, which is technically an alternative sequel for the original film in its own right. Even so, it seems director David Gordon Green couldn't resist leaving the door ajar, just the slightest bit, in case the world wants more time with the infamous Michael Myers. Curious how they set themselves up? Well, basically, the film goes as expected, with Michael dispatching victims left and right until he has his ultimate showdown with the one and only Laurie Strode (Jamie Lee Curtis). Anyway, this leads to that, and Michael eventually gets stuck in Laurie's basement, where she's set an elaborate trap. She pulls a lever that traps him in the basement with steel bars, and then a bunch of spouts spew gas into the basement and the house catches on fire. We're meant to assume Michael dies, but once Laurie has escaped with her daughter and granddaughter, Michael is nowhere to be found. The basement, though engulfed in flames, seems to be empty. There's also that moment at the very end of the credits when you can hear Michael wheezing in lieu of a scene. Is this an indicator that Michael escaped the basement after all? Does this mean he's not all the way dead? Since we never see the charred remains of his lifeless body, we're left to wonder whether he actually dies. And with Michael still possibly on the loose, you can see why a sequel to the sequel may not be out of the question. In addition to the whole Michael situation, one small moment also had me wondering if we might not get the next generation of murder in the Halloween universe. As part of the aforementioned last sequence, Laurie's granddaughter, Allyson, ends up grabbing a big butcher knife and stabbing Michael repeatedly to get him to let go of her mother. At the very end, even after they've escaped and hitched a ride back to town, she's still tightly clutching the bloodied knife in her hand. Is it possible that Allyson felt something she'd never felt before after stabbing Michael? Did wielding the famous weapon give her too much of a thrill? 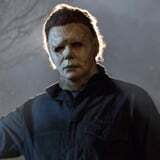 I mean, if there were going to be a sequel, it would be way more refreshing to see a new iteration of "The Shape," rather than the same old Michael Myers. But once again, both of these moments are just small hints, tiny threads that could be stitched into the fabric of a sequel, should the studio and creative minds deem it worthy. In the meantime, we'll be like Laurie Strode, nervously staring out the window and practicing our marksmanship on some very creepy department store mannequins.